Auto Glass Replacement or Repair, we have you covered! 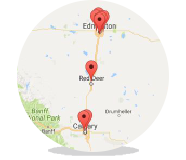 Multiple convenient locations in Edmonton, Red Deer, Calgary, and Sherwood Park. Find the auto glass shop near you. Auto glass services including windshield replacement, windshield repair, car window replacement, mirror replacement, protective coatings, and more. Discover pricing for your auto glass needs and request a quote today. With our experience, supply, and technology, we deliver the best pricing on the best services. Our belief is that when we provide the best product, care about the customer, and do it all for an incredible price, we will succeed. It is no secret why we have serviced well over 2 million vehicles and counting. As you might expect, in Alberta, we do more windshield replacements than anything else. In fact, the high volume efficiency we are able to operate our stores at allows us to not only be experts in the glass industry but also be able to offer incredible pricing. Our belief is that if we work hard, care about what we do, do a lot of it, and do it for a fair price, we can’t lose. With over 2 million customers, this mission has served us well. Therefore, our goal is to provide you with an experience you will want to tell your friends about. 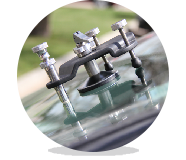 Find out what makes Windshield Surgeons Auto Glass the best choice for your windshield replacement needs. Our rock chip and crack repair services save tens of thousands of windshields each year. So give us a call. We offer the best warranty in the industry, are always there if you have a question, and do it all at the best price. There are a lot of places you can have windshield repair attempted these days. However, none have the combination of skill, reliability, and pricing offered by Windshield Surgeons Auto Glass. We also offer a variety of other auto glass related services such as replacement of tempered side windows, back windows, and mirror replacements. Especially relevant and recommended is the hydrophobic and frost resistant Nano Coating that drastically improves daily life with your windows. Click below to find out more about the various services we have to offer. So whether you live in Edmonton, Red Deer, Calgary, or Sherwood Park and have a car, truck, SUV, tractor trailer or anything in between, we look forward to your call.